Once there were many places to visit like the Hanging Gardens of Babylon. It is known that it is one of the seven wonders of the ancient world. And there are many others, but today I will be talking about the Hanging Gardens of Babylon, the Temple of Artemis, The Great Pyramid of Giza, The Statue of Zeus, the Colossus of Rhodes, the Mausoleum of Halicarnassus, and the Lighthouse of Alexandria. 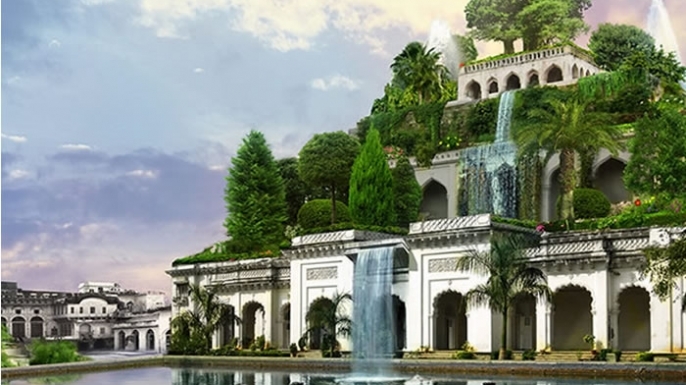 This is a picture of the beautiful Hanging Gardens of Babylon. This garden was located in northern Iraq. Some people think it was in Babylon but others think it was in another city called Nineveh. This garden was built to keep the king's wife feeling like she is at home and doesn't feel homesick. The Assyrians were asked by the king to build the castle and garden for his wife. This garden was started around 600 B.C. and was reported on by a Babylonian priest. It also took 45 years to build the whole garden. What the garden was made of was plants found around Iraq and marble. This is a wonderful recreated picture of the temple of Artemis before it was destroyed. This temple is located in Ephesus which is a near a town in Turkey. This was first built in the Bronze age when they wrote the hymn to Artemis. A man named Herostratus burned it because he wanted to be known and famous. Croesus king of Lydia wanted to rebuild since he was rich and he wanted to. This temple was built to honor and worship Artemis the goddess of the moon and the hunt. The temple was made of pure marble. The is an image of the old Great Pyramid of Giza. This pyramid is located in modern-day Cairo, Egypt. This was built to be pharaoh Khufu's and when he died it would be his tomb. 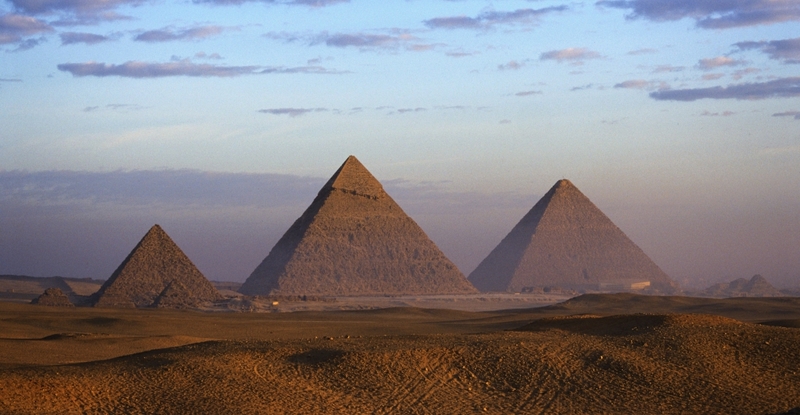 This pyramid was built in 2530 B.C. and it was finished in 2560B.C. The pyramid was made of stone and dry clay. This was made with clay and stone being carried. This pyramid has three burial chambers and it is almost 147 feet tall. On the right is an artist's vision of the Statue of Zeus before it was destroyed. The statue was located in Olympia, Greece. It was built around 435 B.C.E. This was made by Phidias. The statue was pretty tall at 43 feet high. The reason this was built was to shine a light on the Greek god Zeus. This was destroyed because of a fire in the 5th century A.D. The remains of the statue were found in 1950. This was made with ivory and gold-plated plates on wooden frame. 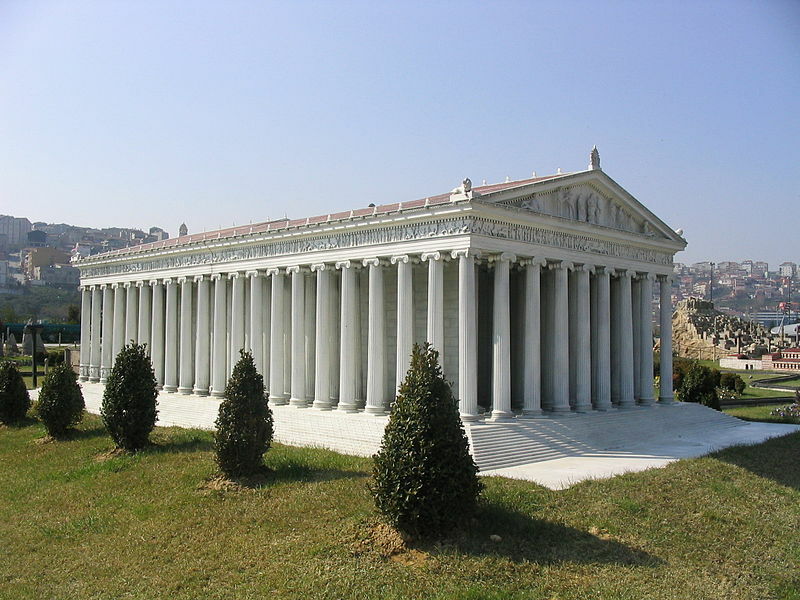 This is the Mausoleum at Halicarnassus. The Mausoleum is located in modern-day Turkey. It was built in 350 B.C. The reason why this was built was for the city king and the tomb of his body. This was damaged by an earthquake in the 13th century A.D. This big building was 140 ft high. This was made of white marble back then when it was created. It was built in a mixture of Egyptian, Greek, and Lycian styles. This is the Lighthouse of Alexandria. Located in Alexandria, Egypt the Lighthouse was built between 290 and 270 BC. The function for this was to guide the ships. The Lighthouse was destroyed by 1303 AD by an earthquake. The size of the lighthouse was 450 ft high. This was made of stone-faced marble. It is said to be the only ancient wonder with a practical application. Juaneliz F. Student, Sofia P. Student "The Seven Wonders of the World, Wonderful Places by Sofia Plata and Juaneliz Figueroa" AwesomeStories.com. May 22, 2017. Apr 25, 2019.